Jeremy Ambers is a video editor by trade and a filmmaker by passion. He graduated from SUNY Oswego in 2000 and spent much of his early adult life working for a small production company in midtown Manhattan. In 2009, Jeremy married and moved across the country to San Francisco. While trying to build a steady flow of freelance editing work, his wife encouraged him to pursue his lifelong goal of becoming a filmmaker. In 2011, he bought a Panasonic HVX-200A and a questionable wireless lavelier mic and caught the very early musings of lighting the Bay Bridge by complete coincidence. 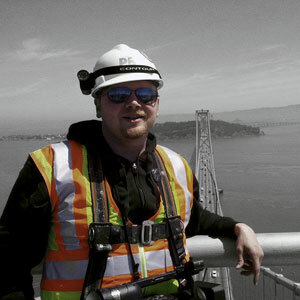 Jeremy spent three years obsessing over the bridge, Leo Villareal and the iconic sculpture now known as The Bay Lights, capturing its beauty and inspiration. The result of his endless dedication can be seen in his first feature-length documentary film, Impossible Light.